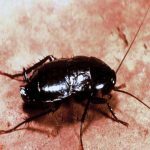 Cockroaches are the most common insects where we can find in our homes and commercial buildings. Oriental Cockroaches probably get their names from trade ships but they are actually from Africa. They are large and very dark compared to other cockroaches. They usually travel through sewer pipes and drains. They prefer dirty places and cooler temperatures than other cockroaches. In addition these create a strong smell and is considered one of the dirtiest of all the cockroaches. Diet: These cockroaches feed on all types of garbage and other organic material. Habitat: Their main habitat includes sewers,wet and decaying areas, such as basements and crawlspaces, firewood and piles of leaves. Impact: Because they crawl through dirty areas and then walk around our homes tracking in lots of bacteria and germs. They can contaminate food by shedding their skins. Their cast off skin and waste byproducts are allergens that can trigger allergic reactions, asthma and other illnesses, especially in children.